Photo by Jacqueline Bennett Gold Star Mother Diane DeLuzio with CTHM President Sue Martucci at her side, reads the names of Connecticut’s fallen in the wars in Iraq and Afghanistan, including DeLuzio’s son. 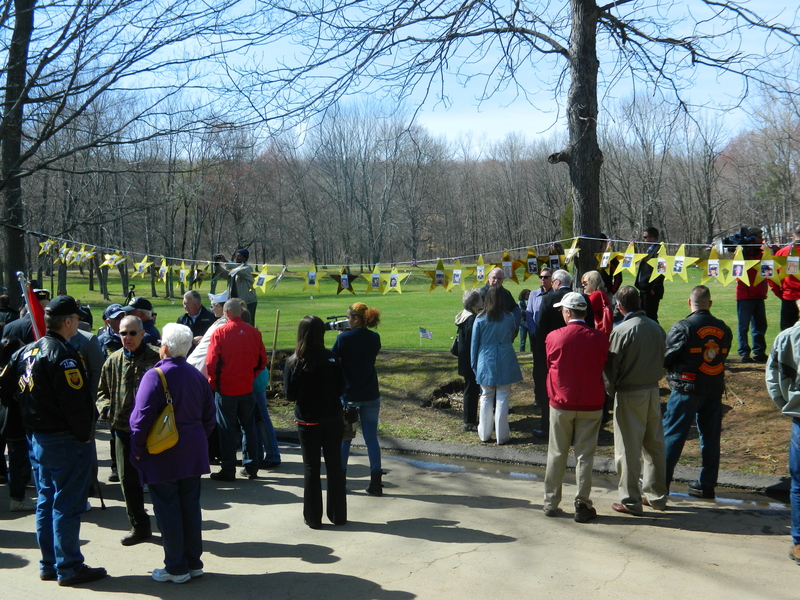 “Hero trees” are scheduled to be planted this month for the Connecticut Trees of Honor Memorial making July, 2014 an extraordinary month for a project that took shape with a few women sitting around a table talking. Currently under construction in Middletown, CT, the memorial will honor the state’s fallen military from the wars in Iraq and Afghanistan, as well as, all veterans. “What is truly amazing is that this project is underway with incredible volunteers and all our equipment is being donated to us,” Sue Martucci, CTHM President, wrote in a recent newsletter. Nonetheless, help is still needed to make this dream a reality and honor Connecticut’s fallen. Martucci is looking for a company that sells concrete pavers willing to donate some pallets – 150 are needed. Gift cards would also be appreciated for fast food restaurants or chain grocery stores to continue providing lunch for volunteers working at the site. As well, the need for volunteers to donate even just a few hours a week continues – including construction professionals, fundraising organizers and media/marketing “enthusiasts” to help publicize the project. 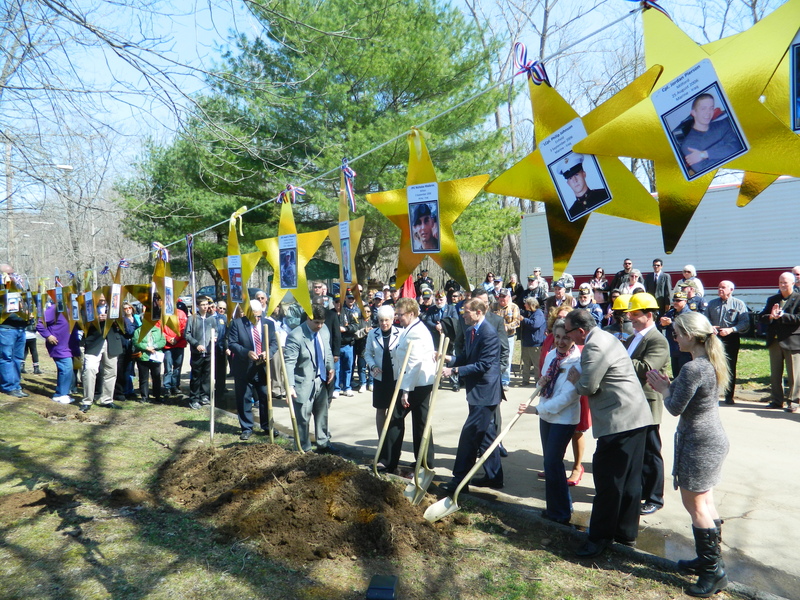 According to Martucci, in addition to the planting of the hero trees, each “hero” granite post and personalized plaques are slated to be installed this month. July is also expected to see the completion of excavation and digging. In the background can be seen the site for the memorial currently under construction. Among the companies and organizations donating “manpower and expertise” are United Rentals of Bloomfield, Retired and Apprentice Operating Engineers Local 478, Dutton & Associates of Glastonbury -Surveyors, Steve Nelson, Architect – Moser, Pilon, Nelson of Wethersfield, Tom Linden, Linden Landscape Architects, LLC of Wethersfield, Jim Horahan, Custom Tree Care LLC of Glastonbury, Joe Butler, Distinctive Gardens & Tree Care LLC of South Windsor, On-Site Services Inc. of Clinton and their employees, Middletown Office of Emergency Management, Lee Wilson, Computers by Lee, LLC and Commander, Avon VFW Post 3272, Mark Babineau, Old Cider Mill Landscaping of Glastonbury. As well, Martucci notes that Sean of Jukonski Truck Sales in Middletown stops by regularly to grease all the machines. “We are ever grateful to Gold Star father Jon Miller of On-Site Services in Clinton for being on the job daily to coordinate the workers and supervise operations, Brian Kronenberger of Kronenberger & Sons Restoration Company of Middletown for being construction advisor and liaison with City of Middletown officials, neighbor and veteran Tony Rosa for operating equipment and helping where needed,” added Martucci. 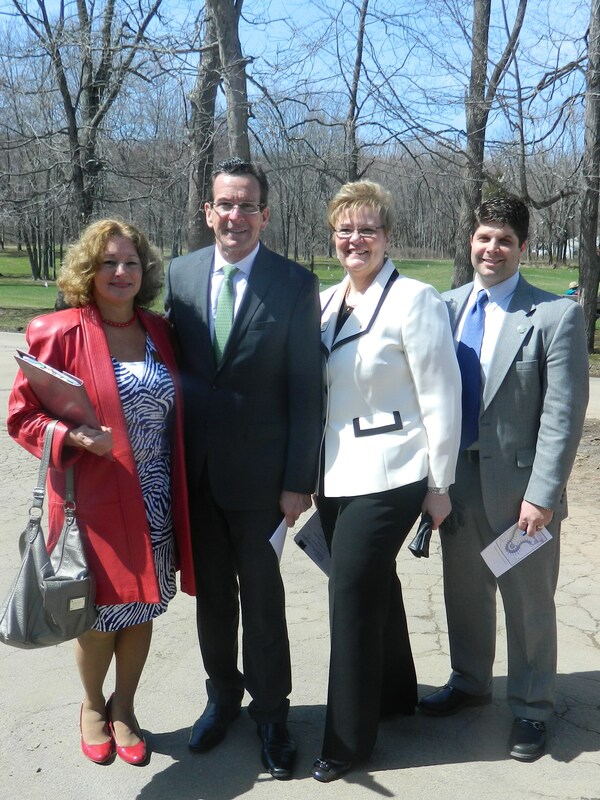 Sue Martucci, Governor Dannel Malloy, Diane DeLuzio and Middletown Mayor Dan Drew shown at the April 17, 2014 groundingbreaking ceremony. Thanks was extended from Martucci to businesses in Middletown for contributing to feed CTHM workers – Wendy’s, Illanos, Nardellis, Roma Pizza, Dunkin Donuts and Tom Hartke, a veteran and supporter. Construction at the CTHM site which is located within Veterans Memorial Park on Walnut Grove Road, is “fully underway” including tree clearing and “backbreaking trenching”, Martucci added. Silt fencing is already installed and surveying and staking is complete. Meanwhile, Martucci reports that more than half a dozen pieces of heavy equipment are on site and being run daily. “A new reflecting pond and shaping the walkway around the pond is taking place,” said Martucci. Connecticut broadcaster Brad Davis and Lt. Gov. 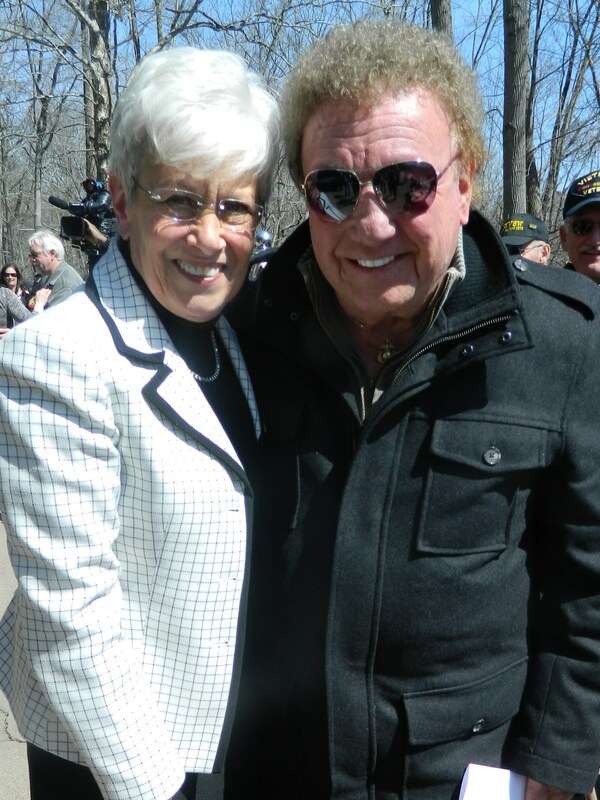 Nancy Wyman, who collaborated on the Wall of Honor at the state Capitol, attended the April CTHM groundbreaking. “Committee members are busy working to finalize designs for the Flag Ceremonial and Entrance plaza, meeting with sculptors and soliciting donations for concrete pavers for the walkway and plazas,” she said. On July 28, 2014 a Trees of Honor Golf Classic will be sponsored by Grade A Home Improvement at Lyman Orchards in Middlefield. Registration is underway – contact Derek or Andrew at 860-874-4848. On October 7, 2014 a statue unveiling and cocktail party is planned with details to come. 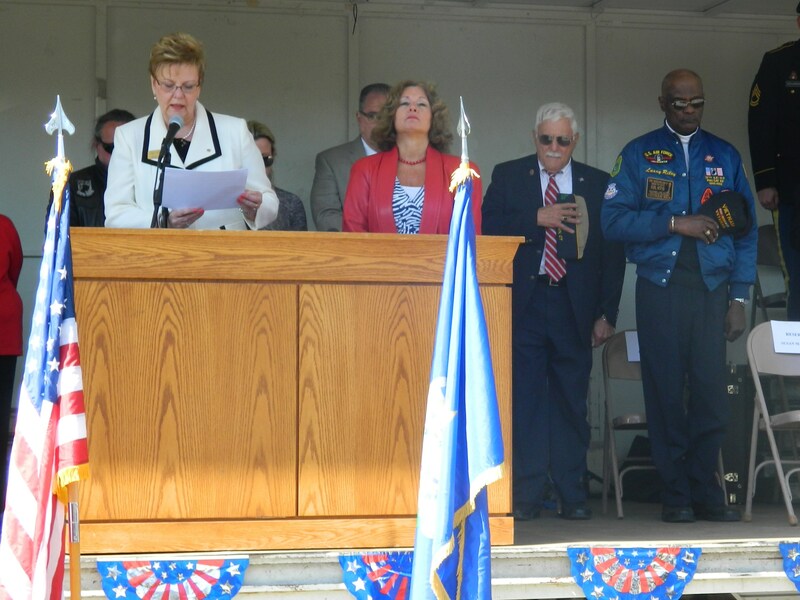 On November 1, 2014 the Patriot Dinner/Dance and Salute to Veterans featuring both silent and live auctions is scheduled with a three course meal and music by the 42nd Street Band. Visit http://www.cttreesofhonor.com and go to EVENTS then click on BUY TICKETS. Tickets are not being sold at the door and reserved seating is limited to tables of eight. Martucci further noted that changes have been made at the CTHM, non-profit organization. Cecile Fazio, chapter president of the Middlesex County Blue Star Mothers, will replace Rose Nolan who is stepping down as treasurer of the executive committee. And, CTHM has a new mailing address: CTHM, Inc., P. O. Box 86, Cromwell, CT 06416 (Mail will be forwarded from the previous Windsor post office box).